T“he World's Worst Man, my most plucky client, J. P. Van Dyn, who now works as a stevedore in the Southampton Docks is sixty three years of age. 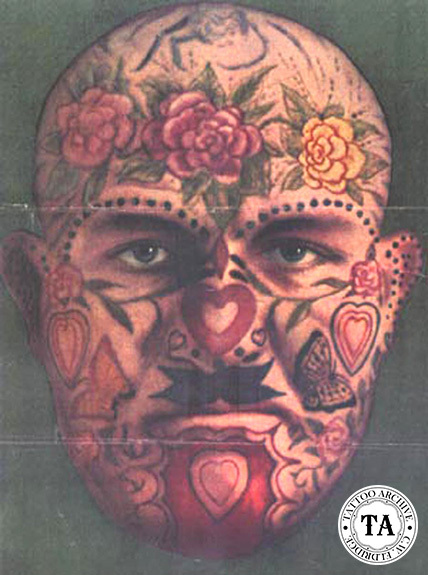 He claims to have been in every famous prison in the world, including Sing Sing, Devil's Island. Very few of my clients, except professional fairground artist, would decide to ornament their faces in such an elaborate and distinct manner as Mr. Van Dyn. He sketched some of the designs himself." The above quote is from one of England’s most famous tattooist, George Burchett.